I had the opportunity last week to visit MMU Crewe (I will never drive there again – it took me nearly three hours to get there in the morning – it’s the train all the way for me from now on) to enjoy David Cooper’s Teaching Landscape Writing study day. I am sometimes (often) a little suspicious of these academic get togethers. They aren’t always immediately useful for a creative writer and as a practitioner rather than a theorist it is hard not to feel like a patient who is awake in the operating theatre overhearing conversations that are really none of their business. That’s a metaphor for this experience I use often – (and unapologetically, seeing as it actually happened to me once) even though I am curious about just about everything. I suppose it is hard to know how to make use of these kinds of learnings – though the day at Crewe was definitely designed with a not-quite-house-trained creative writer with a short attention span and the research skills of a magpie in mind. Highlights of the day involved a wonderfully practical, thoughtful and free-range writing workshop by the accomplished poet Eleanor Rees (here’s a picture of me and Eleanor talking about why rocks brought into a ‘nature’ space aren’t litter, but pop bottles left there by teenagers are – or something like that…) which involved wandering around the edgelands of Crewe business park and writing poems about what the place said to us. I might have broken the rules a little bit, in that I sat down on a bench next to a man eating his packed lunch and reading his kindle and wrote quite a lot about him. Sorry, lunch-hour-man. It was the way you folded your sandwich wrapper so carefully and tucked it back inside your rucksack that made me curious. Were you saving it for something else? Are you a scrap-booker? There were presentations on the new Landscape writing module at MMU run by David which was open to students from both English and Outdoor Studies courses alongside reflective responses from students who have taken the course – which struck me as an entirely brave and humble and useful way of going about things. A wonderful poetry reading from Eleanor. A presentation from Anthea Cooper about her work providing outdoors education for children and young people – providing outdoor spaces to allow children to be curious, wild, collaborative and reflective; putting legs and arms on the kind of intellectual curiosity (I hope) their indoor education was encouraging in them. And finally Gary Priestnall from Nottingham spoke about his work with geography students working on digital mapping projects, adding a digital layer to landscape or a layer of landscape to text and gave me a shed load of ideas about taming, walking, moving, reading and what all of these things might and might not have in common. Embodiment, perhaps. Ace, as the cool kids do not say anymore. My head was whirling – I’m writing a novel (is it a novel? it isn’t looking much like one at the moment) sort of about medicine, and faith healing, and dying bodies, and the changing sands on Morecambe bay, and the decline of the cockling industry, and bespoke suit making, arboriculture, nursing and butchery. There’s walking in it, and pausing on route, and lots of fantasies about travel the body isn’t able to perform. I’m also collaborating with a web designer, two writers and an artist on a new, experimental project that hopes to create a digital literary landscape and use it to help the reader tell a story / play a game (more about this later) and up until the drive home from Crewe hadn’t really figured out what all these things might have in common. I came home and wrote down some words. Wildness. Taming. Children. Reading. Exploring. Journeying. Reclaiming. Medicating. Bridging. Exchanging. Dissolving. Lots of doing words, as my primary school teacher used to say. After I’d done all that the way into the next (and last, I hope) draft of the current novel in progress seemed to appear a little more clearly. Love it when a plan comes together. You can follow David Cooper on twitter here and find out more about his current readings and writings here. The MMU Crewe Department of Interdisciplinary Studies is here. Eleanor Rees’ website is here. This is Widehorizons Outdoor Education centre, run by Anthea Cooper. This is Gary Priestnall’s page at Nottingham University. 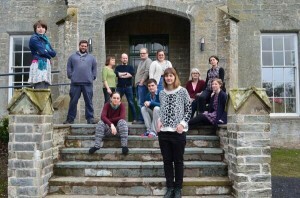 Here’s something special – the opportunity to work closely with three fabulously talented new writers over the course of a year, kicked off with a glorious week at the newly refurbished Hurst. We wrote, played, talked a bit about Games Workshop and childbirth, cooked (not me, but I did eat) admired the scenery, listened to readings, laughed, wrote some more and stayed up far too late and put the world to rights. I spent the week with the wonderful poet Clare Pollard (I first saw her read about 15 years ago – what a small world it is for a Boltonian poet and a Prestonian novelist) and amazingly talented and generous dramatist David Eldridge and their poetry and drama mentees. The Hurst was beautiful – certainly the fanciest Arvon house I’ve ever been in. The workshop table – handmade from local wood – has to be seen to be believed. I slept in John Osbourne’s study, tried to write at his desk, and read The Entertainer in his front room. There’s nothing like a week in a country house to get to know a set of writers well. I always come away from Arvons feeling like I’ve made a new set of friends. Here’s a picture of us all on the front steps of The Hurst practicing our miserable writer faces. 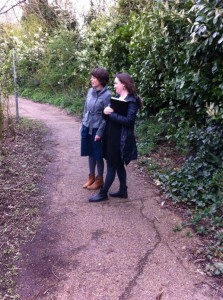 The Jerwood / Arvon mentoring scheme runs annually and is open to anyone who has taken an Arvon course in the previous year. To find out more click here.